Between 26th August and 3rd September 1978 one of Stoke-on-Trent's most significant cultural events of the 20th Century took place. 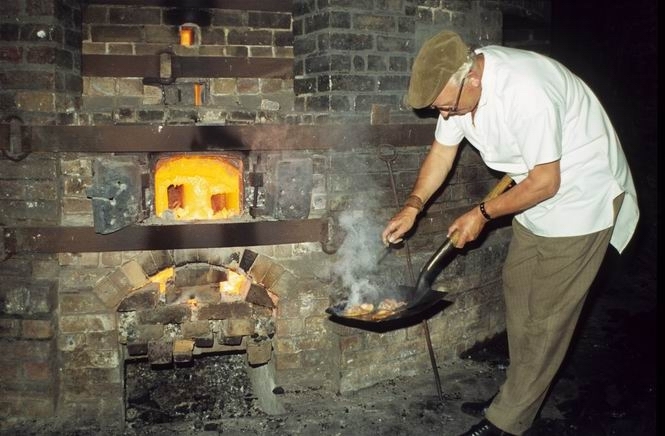 It was the last time a traditional potters' bottle oven was used and fired in The Potteries. David Sekers, Director of Gladstone Pottery Museum and driving force behind the event, described it as "The first time in 20 years, the last time in history." The traditional skills of men who knew how to fire the final oven were recorded on paper, on tape and on film. This blog shows what went on in 1978. A unique record of a unique cultural event. A total of 11,707 visitors attended the firing event and subsequent sales events. The Final Firing was organised by staff and volunteers at the Gladstone Pottery Museum, Longton, Stoke-on-Trent, England. Some of them were youthful and full of energy. Others were elderly and skilled. 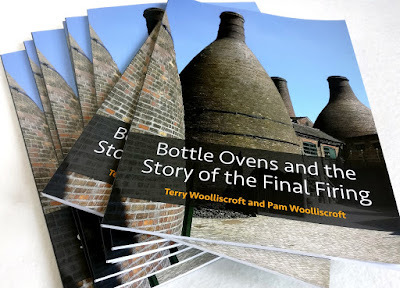 All were enthusiastic and wanted to ensure that the expertise required to fire a traditional Potteries Bottle Oven was recorded for the benefit of future generations. "The first time in 20 years. The last time in history. A once and for all opportunity to witness an important reminder of our local heritage." For three centuries, Staffordshire pottery was fired using coal in hundreds of bottle ovens. Since the Second World War, they have been replaced by cleaner, gas, oil or electric kilns. The Gladstone Pottery Museum now preserves four huge majestic ovens together with one small enamel kiln. They will never be fired again. The Clean Air Act, and their delicate condition prevent it. But in August 1978, using 12 tons of coal from the local Florence Pit, a group of increasingly elderly men who still possessed the skills required, together with a massive team of (younger) volunteers and staff from Gladstone Pottery Museum, set about firing The Last Bottle Oven. This was the last firing, ever, of a coal fired oven, in the traditional way, at the Hudson and Middleton Sutherland Works, near to Gladstone Pottery Museum, Longton. 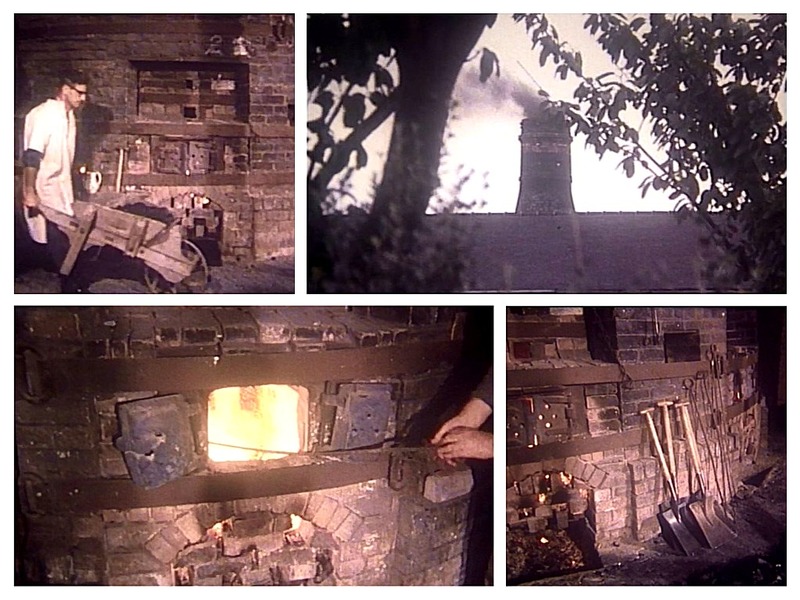 The whole process took 9 days - actually much longer than for a commercial oven firing - and was recorded on ﬁlm for posterity. The mastermind behind the project was David Sekers, Museum Director at the time. 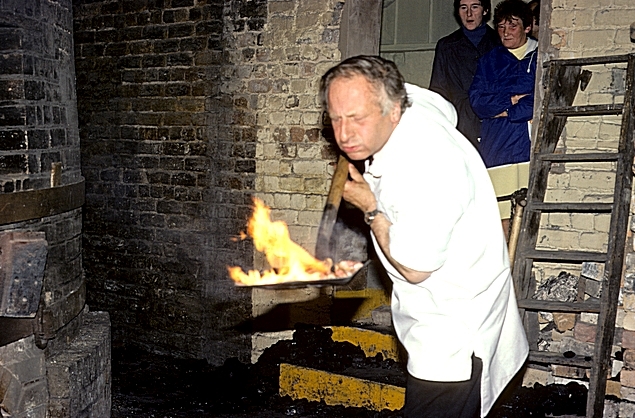 The fireman responsible for the event was Alfred Clough, a local master potter and retired pottery manufacturer. 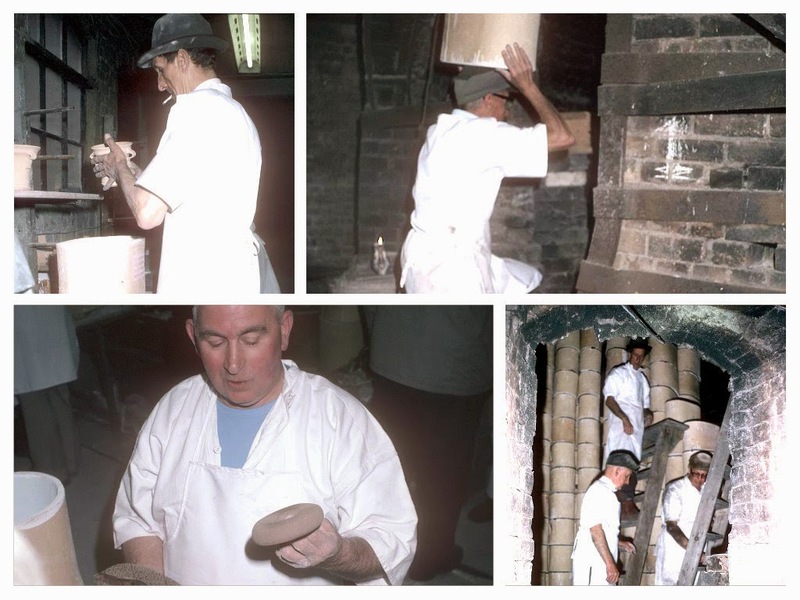 The Last Bottle Oven Firing was just part of the many and exciting years which make up The Gladstone Pottery Museum Story. In 1941 Mr. R J Waller MSc Tech, wrote a detailed technical report about the firing of a bottle oven. The report was written for the British Pottery Research Association. Courtesy British Pottery Research Association, Penkhull, Stoke-on-Trent. By R. J. WALLER, M.Sc.Tech. Here is a link to the report. It gives very good readable introduction to the firing of a glost oven and is highly recommended. WHAT HAPPENED IN THE FINAL FIRING? 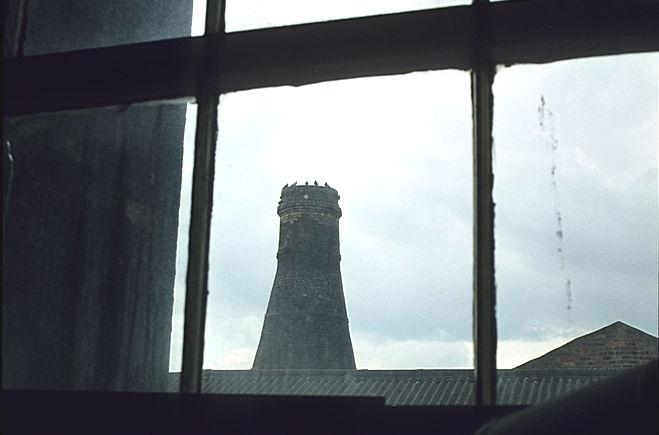 The Last Bottle Oven Firing in The Potteries began on Saturday 26 August 1978. But, for the organising committee, preparations began many months before. 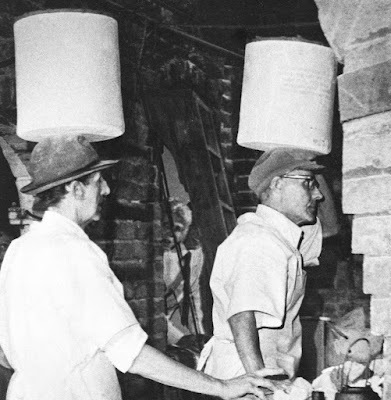 As the location of the bottle oven is in a working factory, Hudson & Middleton (Longton) Ltd., extra precautions had to be taken to prevent any dirt and dust from spreading to the production area during the cleaning up period. A great deal of pigeon droppings had to be removed (the exact tonnage has not yet been worked out!) Volunteer members of the committee and 'volunteers' from the local Detention Centre worked several weekends cleaning the oven and the area around it, repairing various parts of it, and erecting screens to protect the factory area. Meetings with the placers were arranged and volunteer recruitment was organised. Last minute work at 10pm on Friday August 25th 1978, at the firing site, included erecting barriers and displays, painting the shelters for the turnstile attendants and putting up notices and directions. Twelve hours later the public were streaming in and for many people a week of nostalgia began. It is interesting to note that during the firing more local people visited us than on any other occasion. The placers, none of whom had met or worked together before, merged into a well-organised team in less than an hour. The placing of the oven was spread over three days and apart from a few minor hitches everything went according to plan and the oven was filled late on Monday afternoon. A cheer went up and the team of men, who had been laughing and joking throughout the three days, finished the day off with a song. On Tuesday morning the clammins was built by local bricklayer, Billy Ryan, and after a slight delay the fires were ready to be lit. It was left to members of the committee to light a fire each, starting with Pam Bott and ending with fireman Mr. Alfred Clough's grandson, Alistair. Black smoke once more belched out over Longton much to the excitement and appreciation of all those present. The responsibility of the night firing was taken by fireman (the sitter up) Jack Hill who had a team of energetic volunteers who did all the baiting. There were a few people who gathered to stay up throughout the night but most of them did not manage to keep awake for long. One of the debatable points of the week was whether the band of people gathered around the oven at 6am on Wednesday morning were there out of sheer enthusiasm or just to sample the bacon which was cooked on a shovel over the fires. The smell was delicious and the sizzling so spectacular that it has been recorded by the BBC sound archives! Dr Francis Celoria has a go cooking his bacon on a shovel! Shifts changed over on Wednesday morning and Mr. Clough took over once more. After several baitings throughout the day and the taking of trials the firing was announced to be finished at 7.30pm on Wednesday night. For the next two hours nothing was done to the oven at all. The fires were left to gradually burn out. At about 10pm the clammins was brought down. A brilliant glowing orange was revealed. The breaking down of the clammins proved to be the most spectacular part of the firing not only for the excitement as everyone waited to see inside but also because we had forgotten to check if there was anything inflammable nearby with the result that several cables smouldered and melted causing temporary loss of light. For the next two days the oven was left to cool, even so there was still some warmth left in the firemouths on Saturday morning. The ware was drawn from the oven, the majority of it having fired perfectly. At 4pm on Saturday September 2nd the cycle of firing was complete. Throughout the week a film of events was taken for the museum by the University of Aston; a film was made by the local education authority; slide photos were taken by several of our volunteers and a complete log of events was tape recorded by volunteer Terry Woolliscroft. The films will not be shown until sometime next year but there will be post card style pictures of the event at the museum shortly. The ware from the oven was put on sale two weeks after the firing and resulted in large queues forming with some customers even camping out the previous night. The response has been fantastic but there is still a few pieces left and a mail order catalogue is available from the museum.